Retailers are really piling on, declaring early Black Friday sales and hosting special events both in-stores and online.And as we get closer to Black Friday 2010, it seems everyone wants to throw a sale. But sometimes a deal really isn't a deal. Retailers are slapping the Black Friday banner on their regular ads to draw in shoppers and unless you're careful, you might end up with a product you didn't want at a not-very-low price. Take Walmart's early Black Friday sale. This is going on now, online only, and includes free shipping. There are loads of electronics, but choose carefully. Many are store or second tier brands and largely not among the latest or greatest, when it comes to features and technology. 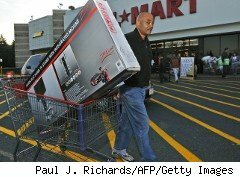 Best Buy's early Black Friday sale began at 10 a.m. this morning, Nov. 12, and includes TVs, cameras and smartphones. Beware of bundled products, like the camera, tripod, memory card and carry case advertised at $99.96, $68 off the total "package." But that's only a deal if you planned to buy each item anyway. A better quality camera may be available for much less on Black Friday itself. Best Buy is advertising a Toshiba 40-inch 1080p HDTV for $399, that's $150 off its former price. Not a steal, but not bad. Certainly better than the 40-inch Toshiba 1080p HDTV Sears is featuring in its Black Friday Now promotion this weekend for $499.99. Sears and its sister store. Kmart, have been running Black Friday Now promotions each weekend since October and each focuses heavily on its core categories. At Sears, sales are heavily weighted in appliances and tools and at Kmart, it's apparel. And this weekend is no exception. Toys R Us is perhaps the most aggressive among retailers when it comes to pre-Black Friday sales, with so many items it's hard not to find value. Keep in mind that deals on Black Friday itself will be more intense, but if you're in the market for a specific item or video game, see a price you like and couldn't be bothered to wait in line in the dark on Black Friday, there's a lot to be said for celebrating, er shopping, now. 40% off Nerf N-Strike Maverick or Recon CS-6 blasters – was $10.99 to $24.99; now $6.59 to $14.99.